Trigonopsis variabilis D-amino acid oxidase (Tv DAO) is a well characterized enzyme used for cephalosporin C conversion on industrial scale. However, the demands on the enzyme with respect to activity, operational stability and costs also vary with the field of application. Processes that use the soluble enzyme suffer from fast inactivation of Tv DAO while immobilized oxidase preparations raise issues related to expensive carriers and catalyst efficiency. Therefore, oxidase preparations that are more robust and active than those currently available would enable a much broader range of economically viable applications of this enzyme in fine chemical syntheses. A multi-step engineering approach was chosen here to develop a robust and highly active Pichia pastoris Tv DAO whole-cell biocatalyst. As compared to the native T. variabilis host, a more than seven-fold enhancement of the intracellular level of oxidase activity was achieved in P. pastoris through expression optimization by codon redesign as well as efficient subcellular targeting of the enzyme to peroxisomes. Multi copy integration further doubled expression and the specific activity of the whole cell catalyst. From a multicopy production strain, about 1.3 × 103 U/g wet cell weight (wcw) were derived by standard induction conditions feeding pure methanol. A fed-batch cultivation protocol using a mixture of methanol and glycerol in the induction phase attenuated the apparent toxicity of the recombinant oxidase to yield final biomass concentrations in the bioreactor of ≥ 200 g/L compared to only 117 g/L using the standard methanol feed. Permeabilization of P. pastoris using 10% isopropanol yielded a whole-cell enzyme preparation that showed 49% of the total available intracellular oxidase activity and was notably stabilized (by three times compared to a widely used Tv DAO expressing Escherichia coli strain) under conditions of D-methionine conversion using vigorous aeration. Stepwise optimization using a multi-level engineering approach has delivered a new P. pastoris whole cell Tv DAO biocatalyst showing substantially enhanced specific activity and stability under operational conditions as compared to previously reported preparations of the enzyme. The production of the oxidase through fed-batch bioreactor culture and subsequent cell permeabilization is high-yielding and efficient. Therefore this P. pastoris catalyst has been evaluated for industrial purposes. D-Amino acid oxidases (DAO, E.C. 1.4.3.3) are well characterized flavoenzymes that have been considered for various applications during the last 20 years. Among these applications, the industrial use of DAO to catalyze the first step of chemo-enzymatic conversion of cephalosporin C to 7-aminocephalosporanic acid  is an outstanding example. It represents the only known case of a large-scale (> 1000 tons/year) biocatalytic process employing an oxidase as biocatalyst (Figure 1A). Other promising applications of DAO include the production of α-keto acids , analytical determination of D-amino acids in biological samples and foodstuffs , the development of DAO biosensors  for analytics, and the elimination of traces of D-amino acids from non-natural L-amino acid preparations . More recently, the use of DAO for the chemo-enzymatic synthesis of physiologically active compounds (e.g. L-methionine, phenyl pyruvate, L-6-hydroxynorleucine, L-2-naphtylalanine) has reinforced the applied potential of this enzyme . Figure 1B is a schematic representation of a deracemisation process employing DAO in its first step and scaled up for industrial application . Industrial applications of Tv DAO. A: Chemo-enzymatic conversion of cephalosporin C to 7-aminocephalosporanic acid. 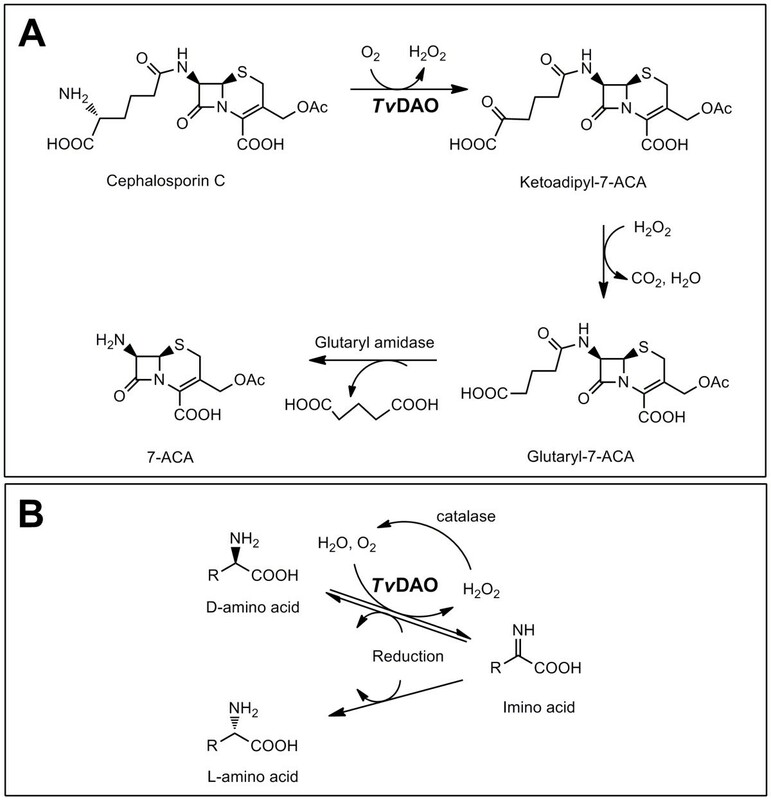 Spontaneous decarboxylation of ketoadipyl-7-ACA (a mino c ephalosporanic a cid) is promoted by the H2O2 formed in the oxidase reaction of Tv DAO. B: Chemoenzymatic production of pure enantiomers of amino acids by amino acid oxidases in combination with imine reduction benefits from the additional presence of a catalase that destroys H2O2. DAO from the yeast Trigonopsis variabilis (Tv DAO)  was the preferred choice of catalyst for cephalosporin C conversion, primarily because it was more efficient on the industrial substrate than other known DAOs, such as enzymes from Rhodotorula gracilis and pig kidney for example . T. variabilis also showed higher productivity (volumetric and specific) for biosynthesis of DAO than relevant other native producers of the oxidase . The operational stability of Tv DAO in biocatalytic conversions has always been a critical issue in process development and has therefore attracted considerable attention. Enzymatic conversion of cephalosporin C depends on O2 as co-substrate and furthermore relies on the H2O2 produced in the enzymatic reaction (Figure 1A). While isolated Tv DAO is sensitive to the conditions applied in the process (bubble aeration, high concentration of oxidants), carrier-bound and entrapped immobilisates of the enzyme showed enhanced persistence [9, 10]. However, demands on the enzyme with respect to activity and stability but also with respect to the costs incurred vary with the process considered. For simple oxidations in fine chemical production, the H2O2 usually has to be removed to avoid enzyme inactivation. To our knowledge, a preparation of Tv DAO fulfilling the requirements of a broad-scope biocatalyst for fine chemical synthesis was not previously available. While Tv DAO production in the native host presents industrial standard, enhancement of specific as well as volumetric productivity as compared to T. variabilis is also desirable (see later). Heterologous expression in E. coli has provided oxidase preparations having fine-tuned stability [10, 11], activity  and even solubility . A number of yeasts including Kluveromyces lactis , Saccharomyces cerevisiae , a catalase-deficient strain of Schizosaccharomyces pombe  and the methylotrophic yeast P. pastoris [16, 17] have also been employed for recombinant production of Tv DAO. Contrary to cephalosporin C conversion where H2O2 formed in the reaction of Tv DAO is crucial to promote oxidative decarboxylation of the α-keto acid product (Figure 1A), processes for production of chiral amino acids (see Figure 1B) benefit from reduced by-product formation at low peroxide levels (see ). A whole-cell biocatalyst producing both Tv DAO and catalase in large amounts would therefore be beneficial and the methylotrophic yeast P. pastoris seemed to be an ideal point of departure for its development. Heterologous gene expression in P. pastoris is often performed under control of the very strong alcohol oxidase 1 promoter (P AOX1 )  which becomes fully induced when methanol is utilized as the sole carbon source. In addition to promoting recombinant protein production, these conditions also lead to an extensive proliferation of peroxisomes, which can cover up to 80% of the cytoplasmic space . Efficient targeting of recombinant Tv DAO into peroxisomes of P. pastoris would allow to make efficient use of this intracellular space for the over-expressed protein and at the same time, co-localize the enzyme producing H2O2 with the one destroying it (i.e. the endogenous catalase ). Another plausible advantage of having Tv DAO and catalase in the same cellular compartment is that conversion of H2O2 by catalase recycles O2 for the oxidase reaction. Previously described P. pastoris strains over-expressing the Tv DAO gene displayed only modest productivity [16, 17, 22]. Driven by a clear industrial demand (Figure 1B) and using a stepwise engineering approach, this paper reports on the successful design and generation of an innovative and notably improved P. pastoris-based DAO biocatalyst. Expression engineering to optimise oxidase production involved the re-design of both the gene and the amino acid sequence of Tv DAO. The coding gene was optimized for expression in P. pastoris according to the codon usage of genes that provide high levels of recombinant protein under methanol induction conditions for P AOX1 (see Material and methods). Like other DAOs, Tv DAO was assumed to be localized in the peroxisomes of the native host . A targeting sequence recognized by either one of the common transport proteins Pex5p and Pex7p is a general requirement for peroxisomal protein import. A bioinformatic analysis of the Tv DAO primary structure using TargetP 1.1  and PSORTII  revealed the absence of a Pex7p-selective motif PTS2. The occurrence of PTS1, the sequence recognized by Pex5p, was uncertain using publicly available predictor software [25, 26] but indicated the C-terminal peptide -Pro-Asn-Leu (PNL) as a putative PTS1. With the aim of enhancing peroxisomal transport of the enzyme under conditions of heterologous expression, we exchanged the native PNL motif by the well known peroxisomal targeting sequence -Ser-Lys-Leu (SKL) which has previously been successfully exploited to achieve peroxisomal localisation of recombinant green-fluorescent protein in P. pastoris . Four different gene combinations were obtained by combining native and codon-optimized genes with the C-terminal sequence motifs SKL and PNL. This permutation was necessary because of the currently limited ability to predict the actual success of codon optimization. These DAO variants were combined with the necessary 5'and 3' DNA sequences for expression cassettes delivering chromosomal integration in P. pastoris and expression under control of P AOX1 . Pichia transformants were cultivated in 96-well format  and screened for putative single copy strains using an enzyme-coupled assay for fast detection of DAO activity. This was done under the assumption that expression increases with increasing copy numbers of integrated expression cassettes. Only single copy strains allow the comparison of the effect of individual gene constructs. Quantitative real time-PCR was then used to analyze the selected strains, and the results confirmed that comparable number of expression cassettes (1-2 copies) had been integrated in each strain. These "low-copy-number" strains were compared with respect to biomass formation and enzyme production in 1.5-liter bioreactor cultivations (Table 1). Among the four strains, the strain Tv1 harbouring the codon-optimized gene for production of Tv DAO-SKL showed the highest DAO activity. The exchange of the native putative peroxisomal targeting sequence -PNL to -SKL had no positive effect on enzyme production when the native gene was used (strains Tv5a and Tv1a). However, the same substitution brought a substantial increase in oxidase activity when comparing the codon-optimized genes (strains Tv5 and Tv1). The engineering strategies directed towards codon optimization, which is expected to facilitate translation and optimized subcellular targeting at the same time resulted in a synergistic effect on whole cell Tv DAO activity. Strain Tv1 showed an about 5-fold improvement in specific oxidase activity as compared to the reference strain Tv5a. To our knowledge, this is the first report describing a combination of PTS1 exchange with codon optimization of a gene to improve intracellular expression. Enzyme and strain engineering for efficient expression of Tv DAO in Pichia pastoris. Enzyme activities are reported for P. pastoris cells obtained in 1.5-L bioreactor cultivation employing standard induction with 3 mL/min methanol. Codon usage: native as in the original Tv DAO gene, or optimized for expression using the AOX1 promoter. PTS1 - peroxisomal targeting using the native C-terminal tripeptide PNL or the engineered motif SKL. CN: Number of copies of the expression cassette integrated into the P. pastoris genome. wcw: wet cell weight. Activity measurements were performed three times revealing a standard deviation of < 10%. All low copy strains except Tv1 which integrated a single copy of the expression cassette containing the codon optimized DAO gene with -SKL C-terminal end, allowed biomass concentrations well above 200 g/L using standard P. pastoris cultivation procedures including methanol feed in the production phase. A relatively lower biomass yield of 144 g wcw/batch for Tv1 employing the same cultivation conditions might be explained by the stress, which is generated when large amount of recombinant DAO accumulate in the cell. The strain Tv1 grew normally in glycerol containing media where Tv DAO expression was repressed, but not during the induction phase using methanol. Similar observations were made with other yeast host organisms, where reduced growth during induction due to an apparent cell toxicity of recombinant DAO was reported [14, 16]. The codon-optimized gene for Tv DAO-SKL was used for further strain development. A new expression construct was made employing the expression vector pPpB1, which facilitates the generation and detection of P. pastoris multi-copy transformants. Using activity-based screening of P. pastoris transformants, the best active strain denoted Tv1_mc was selected. Characterization by real time-PCR revealed integration of about 16 - 17 copies of the expression cassette. Table 1 shows that the Tv1_mc strain gave a twofold enhancement of specific oxidase activity as compared to the single copy clone Tv1. This result implies that the number of gene copies did not translate linearly into an increasing titre of active Tv DAO. Notwithstanding, Tv1_mc is the most efficient host for Tv DAO production that has been reported so far. A comparison with earlier reports shows that this strain reached an expression level up to 1.5 and 1 order of magnitude above the expressions levels reported for E. coli and P. pastoris, respectively [13, 17]. Other yeasts such as S. cerevisiae and K. lactis showed significant lower Tv DAO production . Unfortunately, the biomass yield for the multi copy transformant Tv1_mc was even lower than in case of the strain Tv1. As with Tv1, growth was impaired only during induction with methanol. For comparison reasons we constructed another multi-copy strain of P. pastoris, termed Tv1a_mc (native gene with -SKL). This strain produced a lower amount of Tv DAO activity (550 U/g wcw) than the strains Tv1 and Tv1_mc containing codon optimized genes and it grew normally in the methanol feeding phase. This finding further supports the notion that the recombinant oxidase, at least when it exceeds a certain level in the cell, seems to be inhibitory to P. pastoris growth. We therefore considered optimization of the cultivation and induction conditions for recombinant DAO protein production by the best strain Tv1_mc. Using the methanol feed of 3 mL/h as a benchmark, alternative strategies for fed-batch cultivation of Tv1_mc were evaluated. It was known [29–32] that a mixed substrate feed in the induction phase can support P. pastoris growth and productivity for the target protein at the same time. Figure 2 depicts the results obtained using feeds of glucose-methanol and glycerol-methanol (each at 3 mL/h) and a reduced pure methanol feed at 1.5 mL/h. 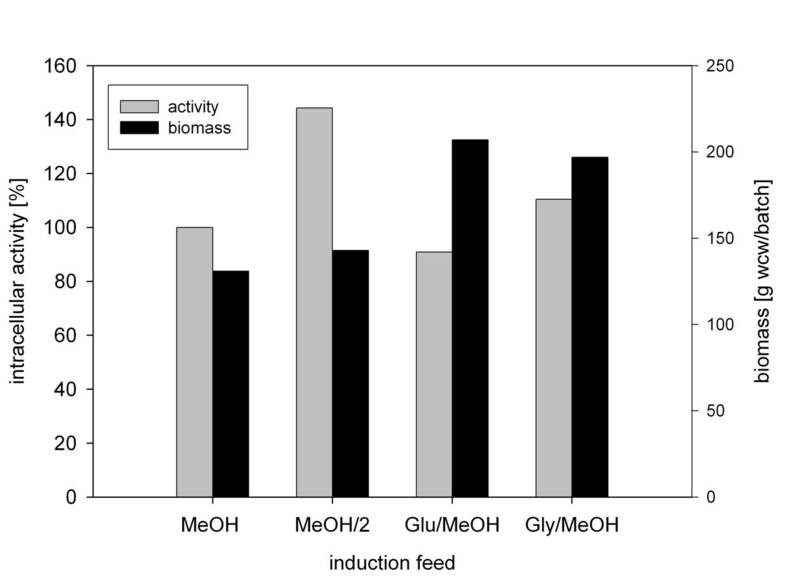 The switch from pure methanol feed to mixed substrate feed caused an about 40% increase in biomass yield (~200 g wcw/batch) without compromising the specific activity of the yeast cells. Glycerol-methanol was superior to glucose-methanol at the evaluated feed rate. On the other hand a reduced flow rate (1.5 mL/h) of the methanol feed resulted in a 1.4-fold enhancement of specific activity as compared to the reference, while the biomass yield remained rather low (~140 g/batch). High-cell-density bioreactor cultivation of P. pastoris strain Tv1_mc using induction with a mix-feed strategy. Values are referenced to oxidase activity obtained using the standard methanol feed and set as 100%. The fed-batch induction phase lasted 90 h in each case. MeOH: 3 mL/h methanol. MeOH/2: 1.5 mL/h methanol, Glu/MeOH: 3 mL/h glucose-methanol mixture, Gly/MeOH: 3 mL/h glycerol-methanol mixture. Activity measurements were performed three times, resulting in standard deviations of < 14%. However the volumetric productivity under these conditions was the highest. The Tv1_mc cells subjected to induction by a reduced methanol feed gave a volumetric oxidase yield of 218 kU/L and a productivity of 2.0 kU/(h L). In comparison the Tv1_mc strain fed with glycerol-methanol resulted in lower yields of 167 kU/L (1.5 kU/hL), and 152 kU/L (1.4 kU/hL) for glucose-methanol induction. These values clearly exceeded those of other known Tv DAO expression strains as summarized in Table 2. Comparison of relevant host strains used for production of Tv DAO. Non standardized conditions used for assaying the enzyme activity in different publications make direct and quantitative comparison of published data difficult. Due to already described instability issues of the enzyme a cellular "encapsulation" of the oxidase seemed a promising option. Therefore intact cells obtained in a standard bioreactor cultivation of Tv1 (methanol feed of 3 mL/h) were subjected to stability examination. The determination was performed according to a previously reported assay that provides a first-order inactivation constant (kin) as measure of the operational (in)stability of the oxidase activity . The value of kin is inversely proportional to stability, according to the relationship τ (half-life time) = ln2/kin. Preliminary results showed an extraordinary half-life time of more than 10 h for the whole cell catalyst Tv1_mc. However, based on the same oxygen consumption measurements the specific oxidase activity of intact Tv1_mc cells (5 U/g wcw) was less than 1% of the latent intracellular activity, presumably because of severe mass transfer limitations occurring in the intact cell system. On the other hand the analysis of a lysate preparation after centrifugation was examined as the soluble fraction and the pellet fraction (probably containing partially lysed cells and peroxisomes) and showed the opposite results. The soluble fraction confirmed the high oxidase activity (~1200 U/g wcw) measured before but a high kin value of 0.0208 min-1 (τ = 0.5 h). Because kin for the partially lysed pellet fraction was only one-tenth of the value measured for the soluble fraction (kinpellet fraction = 0.0026 min-1; τ = 4.4 h) we still felt strongly encouraged to pursue the development of a whole-cell catalyst. P. pastoris Tv DAO-containing Tv1_mc cells served as the starting material. While cell permeabilization was a clear option to attenuate diffusional effects, it was a challenge to prevent a trade-off between enhancement of substrate availability and loss of enzyme stability in the permeabilized whole-cell catalyst. Among various protocols proposed for yeast cell permeabilization , the treatment with 2-propanol appeared to be most suitable for our purpose because of its simplicity, efficiency and low costs. Batches of Tv1_mc and Tv1a_mc cells (10 g each) containing about 1300 and 500 U/g wcw intracellular activity, respectively, were lyophilized prior to treatment with isopropanol considering that handling of dried biomass is easier and more reproducible than that of wet biomass. Key variables of the permeabilization (concentrations of isopropanol and biomass, incubation time) were examined systematically. Oxidase activity measured in the treated cells was related to the total intracellular activity (Table 3). Freeze-dried cells suspended in buffer were poorly active. However, their incubation in aqueous suspension caused the gradual "appearance" of enzyme activity, reaching ~20% of the maximum available activity after 20 min. Use of isopropanol further enhanced the apparent activity, yielding an effectiveness factor η (= apparent activity/total intracellular activity) of 0.48 (= 627/1300) under optimized conditions where 10% (by volume) of co-solvent was applied. A suitable incubation time was between 5.3 and 10.7 h. Concentrations of isopropanol greater than 10% caused a decrease in η, and incubation times longer than 5 h did not result in further improvement. Selected whole-cell preparations showing high η (> 0.40; Table 3) were analyzed for the stability of the oxidase activity under operational conditions. Values of kin (hence, the stabilities) were not affected by the permeabilization as compared to the corresponding kin (kinperm. cells = 0.0023 min-1) reaching at least the stability of the Tv1_mc pellet fraction. Different biomass concentrations in the range 4 - 200 g/L were examined for permeabilization where the highest biomass level reflects the end concentration for standard fed-batch enzyme production in the bioreactor. 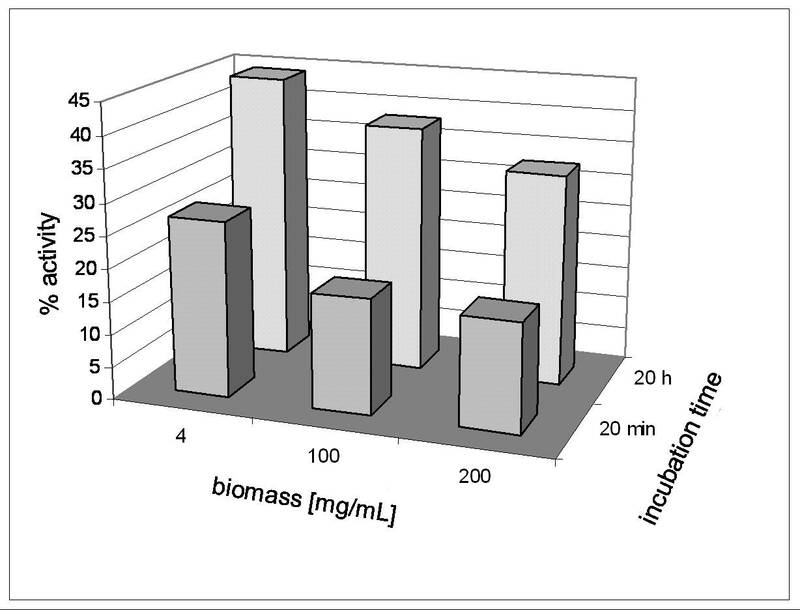 The value of η obtained through permeabilization in the presence of 10% isopropanol was independent of the biomass concentration although the time required to achieve a maximum level of apparent activity increased with increasing biomass concentration (Figure 3). The stability of the whole-cell catalysts was not affected by the variation of biomass concentration during permeabilization. These results led to the conclusion that the permeabilization of Tv1_mc delivered a novel and promising whole-cell catalyst that was equally active (~500 U/g wcw) but three times more stable than the reported E. coli oxidase preparations . The stability of Tv DAO in permeabilized lyophilized P. pastoris cells relative to the cell free P. pastoris preparation was enhanced by one order of magnitude. Effect of biomass concentration on permeabilization of recombinant Pichia pastoris cells expressing Tv DAO. Cells of Tv1_mc cultivated in a bioreactor were treated with isopropanol for 20 min and 20 h. The activity of permeabilized cells is given as a percentage of the total intracellular activity (1283 U g/wcw) measured after cell lysis. Activity measurements were performed three times resulting in standard deviations of < 5%. Systematic optimization of process variables for the permeabilization of P. pastoris cells expressing Tv DAO. The accessible activity is the activity of the whole-cell system after permeabilization, as measured in U/g wcw and expressed as η, the effectiveness factor (= apparent activity/total intracellular activity), whereas the total intracellular activity was determined after cell disruption with a French Press. Strains Tv1a_mc and Tv1_mc contained 550 and 1283 U/g wcw of total intracellular activity, respectively. Lyophilized Pichia cells were used for permeabilization with a concentration being constant at 4 mg/mL. Results in the first row referred to experiments carried out with intact cells obtained from one standard bioreactor cultivation. Permeabilization was performed three times per defined condition, with a standard deviation of the effectiveness factors of < 5%. A multi-level engineering approach was successfully applied to develop an innovative whole-cell enzyme preparation of Tv DAO that is suitable for applications in industrial deracemization processes (Figure 1B). The outstanding capabilities of P. pastoris in recombinant protein production were harnessed to provide high specific activity (1.3 kU/g wcw) and, due to high cell density cultivation of P. pastoris, also very high volumetric oxidase activities (150 kU/L) under standard induction conditions, which could be improved by a reduced methanol feed (218 kU/L). These values are well above the highest levels reported in literature (see Table 2). Mild permeabilization of the Pichia biomass allowed about half of the latent intracellular activity to be utilized, while at the same time retaining the good operational stability of the enzyme entrapped in the cell matrix of P. pastoris peroxisomes. Peroxisomal targeting might be a generally useful strategy of producing recombinant oxidases in P. pastoris, especially under circumstances where a whole-cell catalyst preparation is considered and immediate removal of the H2O2 generated in the enzymatic reaction is desired. In addition, when protein expression is induced by methanol induction, increased peroxisome formation provides increased capacity for the expressed and targeted oxidase. Due to these advantages a P. pastoris-based whole-cell Tv DAO preparation and deracemisation processes (Figure 1B) are being scaled up and the new Tv DAO whole cell catalyst can be rapidly integrated into the existing process. Oligonucleotides were purchased from IDT Integrated DNA Technologies BVBA (Leuven, Belgium) or Invitrogen Corp. (Carlsbad, CA, USA). Sterile water was from Fresenius Kabi Austria (Graz, Austria). All DNA-modifying enzymes were obtained from Fermentas GmbH (Burlington, Ontario, Canada). Unless otherwise stated, all chemicals were from Carl Roth GmbH (Karlsruhe, Germany), Becton, Dickinson and Company (Franklin Lakes, NJ, USA) or Sigma-Aldrich (St Louis, MO, USA). Complex media contained 10 g/L yeast extract, 20 g/L peptone and 20 g/L glucose (YPD). Media for plates were solidified by addition of agar to 1.5% w/v. The minimal media used in this work contained 200 mM potassium phosphate buffer (pH 6.0), 13.4 g/L yeast nitrogen base and 0.0004 g/L D-biotin. They differed with respect to the carbon source concentration: 10 g/L glucose for BMD, 1 and 5% (by vol.) methanol for BMM2 and BMM10, respectively. Escherichia coli TOP10F' (Invitrogen Corp.) was used as host for all cloning steps. The protein sequence [GenBank: AAR98816] of D-amino acid oxidase from Trigonopsis variabilis ATCC 10679 was employed for the design of a codon optimized gene for over-expression in Pichia pastoris under conditions of methanol induction, using the program Gene Designer (DNA2.0, Menlo Park, CA, USA) with a threshold set at 10%, preferring the best codons. Repetitive codons were manually corrected. The optimized codon usage (see Table 4) was calculated from three highly transcribed genes encoding enzymes of the Pichia pastoris methanol utilization pathway (alcohol oxidase 1 Aox1 [GenBank: U96967]; dihydroxyacetone synthase Das1 [GenBank: FJ754551]; formaldehyde dehydrogenase Fld [Genbank: XP_002493270]) and from a plant gene (Hevea brasiliensis hydroxynitrile lyase Hb HNL [Genbank: U40402]) that is efficiently expressed in P. pastoris . The resulting gene was made by gene synthesis. The native gene for Tv DAO was kindly provided by Ingenza Ltd. (Roslin, UK). Exchange of the putative peroxisomal targeting sequence at the C-terminus of Tv DAO was carried out using a PCR employing a suitable modified reverse primer (see Table 1). Phusion™ High-Fidelity DNA polymerase was used in this and all other PCR experiments applying a protocol provided by the supplier (Finnzymes Oy, Espoo, Finland). Codon usage table designed for high level expression during methanol induction in P. pastoris. Products obtained from PCRs were purified with the QIAquick PCR Purification Kit (Qiagen, Hilden, Germany), digested with Spe I and Asc I (native Tv DAO genes) or EcoR I and Not I (synthetic Tv DAO genes). The digested DNA fragments were ligated via Spe I/Asc I or Eco RI/Not I restriction sites into equally digested in-house E. coli - P. pastoris shuttle vectors pPpT2 or pPpB1 (TU Graz strain collection BT 5713 and 5709, respectively) that provide single or multi-copy chromosomal integration of target genes in P. pastoris, respectively. Relevant features and sequence elements of these shuttle vectors include: origin of replication of the E. coli plasmid pBR322 ; the AOX1 promoter (P AOX1 ) starting with a Bgl II site; a multiple cloning site with unique restriction sites for Eco RI, Spe I, Asc I and Not I; the AOX1 transcription termination sequence; and an antibiotic resistance cassette consisting of a synthetic bacterial promoter called EM72 in tandem with a truncated version of the P. pastoris ILV5 (acetohydroxyacid reductoisomerase) promoter, a synthetic gene coding for the amino acid sequence of bleomycin (ble) conferring resistance against Zeocin from Streptoalloteichus hindustanus. The ble gene had been codon optimized for function in E. coli as well as P. pastoris. The pPpT2 shuttle vector further contained the P. pastoris AOD (alternative oxidase) transcription termination sequence  at the 3' of the coding sequence of the synthetic ble gene. The pPpB1 vector had the same additional features except that the Saccharomyces cerevisiae ADH1 (alcohol dehydrogenase 1) promoter and terminator controlled the transcription of the ble gene. A MutS strain derived from P. pastoris CBS 7435 (TU Graz strain collection number BT 3132) was used for transformation. A condensed protocol  was used in which the shuttle vectors were employed after linearization with Bgl II and purification with the QIAquick PCR Purification Kit (Qiagen). Transformations were performed in ice-cold electro-transformation cuvettes (0.2 cm, Cell Projects Ltd., Kent, UK) using pulse at 200 Ù, 25 μF and 1.5 kV. 0.5 mL of ice-cold sorbitol (1 M; in water) was added immediately after the electro shock, and the suspension was transferred to a sterile 12 mL polypropylene tube (Greiner, Frickenhausen, Germany). YPD medium (0.5 mL) was added to the tube which was then incubated for 2 h at 30°C using agitation at 60 rpm. After this regeneration step, aliquots (0.2 mL) were plated on solid selection medium containing 100 mg/L Zeocin. The number of copies of Tv DAO expression cassettes integrated into the P. pastoris genome was determined by quantitative real-time PCR as described in  employing the endogenous ARG4 gene as a reference. Power SYBR Green PCR Master Mix (Applied Biosystems, Foster City, CA, USA) was used in an ABI PRISM 7300 Real Time PCR System (Applied Biosystems). The following oligonucleotide primers were applied in a concentration of 250 nM when using 2 ng genomic DNA of P. pastoris as template: AOX1-fw-RT (gaagctgccctgtcttaaacctt)/AOX1-rv-RT (caaaagcttgtcaattggaacca) and ARG4-RT-fw (tcctccggtggcagttctt)/ARG4-RT-rv (tccattgactcccgttttgag). The temperature conditions were: 10 min at 95°C; 40 cycles for 15 s at 95°C and 60 s at 60°C followed by a dissociation step (15 s at 95°C, 30 s at 60°C, 15 s at 95°C) at the end of the last cycle. P. pastoris transformants were first cultivated in deep well plates (96-well format) using a modified procedure after Weis et al. in a Multitron II stackable incubation system (Infors, Bottmingen, Switzerland). Briefly, following a 60 h long incubation in 250 μL BMD medium (320 rpm, 28°C, 80% air humidity), the cultures were induced by adding 250 μL BMM2. 50 μL BMM10 were additionally supplied after ~70 h as well as after ~84 h total cultivation time. After a 48 h-long induction phase (108 h of cultivation). 50 μL of each culture were transferred to V-bottom microtiter plates (Greiner Bio-One #651101) from which glycerol stocks were prepared. The remainder of the cell suspension was centrifuged (Eppendorf centrifuge 5810R: 3220 × g, 4°C, 10 min) and the pellets were collected for activity determinations. 300 μL Yeast Buster reagent (Novagen, Darmstadt, Germany) were added to the cell pellet which was resuspended and incubated for ~30 min at room temperature using agitation at 1400 rpm using a TITRAMAX 1000 shaker (Heidolph Instruments GmbH & Co. KG, Germany). Following removal of cell debris by centrifugation (Eppendorf centrifuge 5810R: 3220 × g, 4°C, 10 min), 10 μL of the supernatant were employed for measuring Tv DAO activity using the photometric assay as described below. The inoculum (optical density OD600 10 - 15) was prepared in two preculture steps in 250 mL baffled shake flasks using 50 mL BMGY (10 g/L yeast extract, 20 g/L peptone, 100 mM potassium phosphate buffer (pH 6.0), 13.4 g/L yeast nitrogen base and 10 g/L glycerol). Incubations were done for about 12 and 8 h at 28°C using agitation at 120 rpm (Certomat BS-1). A 1.5-L fed batch-pro® bioreactor system (DASGIP AG, Juelich, Germany) equipped with a six-bladed Rushton turbine impeller and suitable controllers for pH and dissolved O2 was used for biomass and enzyme production. The basal medium of Invitrogen Corp. was modified according to Hellwig et al. and contained 40 g/L glycerol, 0.17 g/L calcium sulphate dihydrate, 2.32 g/L magnesium sulphate heptahydrate, 2.86 g/L potassium sulphate, 7.18 g/L aqueous phosphoric acid (85%), 0.64 g/L potassium hydroxide, 0.22 g/L sodium chloride, 0.6 g/L EDTA disodium dihydrate, 0.20 mL/L antifoam (ACEPOL 83 E; Lubrizol Additives, Wickliffe, Ohio, USA). PTM1 trace element solution was added (4.35 mL/L medium) after in situ sterilisation of the basal medium. Its composition was as suggested by Invitrogen, namely 0.2 g/L biotin, 6 g/L CuSO4 × 5 H2O, 80 mg/L NaI, 3.067 g/L MnSO4 × H2O, 0.2 g/L Na2MoO4 × 2 H2O, 20 mg/L H3BO3, 0.916 g/L CoCl2 × 6 H2O, 20 g/L ZnCl2, 65 g/L FeSO4 × 7 H2O, and 5 mL/L H2SO4. The pH of the final medium was adjusted to 6.0 using an ammonia solution (25% by volume; technical quality). The cultivation started from an initial liquid volume of 0.65 L (in total) with 50 mL of the 2nd preculture in a batch phase (28°C, aeration at 0.7 L/min) in which glycerol served as the sole source of carbon. The stirrer speed varied between 500 and 1200 rpm as required to maintain a level of dissolved O2 greater or equal 30% air saturation. The ammonia solution was used for pH control and likewise as nitrogen source. Following depletion of glycerol in the batch phase, typically after ~16 - 18 h, glycerol was fed from a 700 g/L substrate solution containing 12 mL/L PTM1 solution. The feed flow rate increased exponentially over 6 h from 4.77 mL/h to 11.72 mL/h, afterwards gradually decreased to zero within 2 h. Decreasing glycerol supply was accompanied by the start of methanol feeding (supplemented with 12 mL/L PTM1 solution). The flow rate was increased linearly to 3 mL/min within the 2 h where the glycerol feed was reduced and remained constant at this high level for another 90 h. Feeding of mix-substrates (methanol/glucose and methanol/glycerol) occurred in the same manner. Both mix fed contained 452 g/L methanol and 346 g/L glucose or 321 g/L glycerol, respectively and were supplemented with 12 mL/L PTM1 solution. Biomass was harvested using an Avanti J-20 XP centrifuge (Beckman Coulter, Krefeld, Germany) employing a JA-10 rotor at 2831 × g (10 min, 4°C). The pellet was washed once with a 100 mM potassium phosphate buffer (pH 6.0) and stored frozen (-20°C) until further use. For cell lysis the thawed cell mass (~5 g) was suspended in 10 mL Tris buffer (100 mM, pH 7.5) and passed 2 times through an Aminco French press using an FA-030 cell (SLM Instruments, Rochester, NY, USA) at approx. 150 bar. Insoluble material was separated from the supernatant by centrifugation (20 min, 14000 rpm, 4°C) and further washed three times with 10 mL Tris buffer as above. Both the supernatant and the insoluble fraction were used for the measurement of Tv DAO activity. An enzyme-coupled colorimetric assay for oxidase activity was used as described by Alexeeva et al. with slight modifications. Briefly, 10 μL of appropriately diluted Yeast Buster cell lysate were transferred into a microtiter plate well. Assay solution (190 μL) was added and colour development (measured at 510 nm) monitored for 5 min at room temperature. The composition of the assay solution was 100 mM potassium phosphate buffer (pH 7.8), 0.5 mM 2,4,6-tribromo-3-hydroxybenzoic acid, 0.75 mM 4-aminoantipyrine, 10 mM D-methionine, and 0.025 mg/ml horseradish peroxidase (type VIa; Sigma-Aldrich catalogue number P6782). A direct assay of Tv DAO activity used measurement of O2 consumption at 30°C. A previously described glass mini-reactor with a working volume of 30 mL was employed . The reactor was equipped with a fibre-optic oxygen micro-optode (PreSens GmbH, Regensburg, Germany), a temperature sensor, and a teflon sparging tube (1 mm internal diameter) through which air O2 was supplied. Mixing was achieved with a magnetic stirrer operated at 300 rpm. A previously reported procedure was applied for the determination of "operational" stability of the different oxidase preparations . Air was sparged into the mini-reactor at a flow rate of 30 L/h. The substrate solution contained 100 mM D-methionine dissolved in 100 mM Tris buffer (pH 7.5). The reaction was started by addition of a suitable amount of oxidase (cell extract, whole-cell preparation) such that the level of dissolved O2 initially dropped to about 50 μM (~25% air saturation). The time course for [O2] was then recorded until the concentration of oxygen returned ~100% air saturation. Data were fitted with an exponential decay function to obtain an estimate for the first-order inactivation constant kin . About 10 g wet P. pastoris biomass was suspended in 10 mL distilled water and freeze-dried over night using a Christ Alpha 1-4 LSC freeze dryer (Martin Christ Gefriertrocknungsanlagen, Osterode, Germany) operated at 0°C and 0.570 mbar. Permeabilization by isopropanol was carried out in a total volume of 1 mL, using 4 mg dried cells unless otherwise stated. The alcohol concentration was varied in the range 2 - 40% (by volume, in water). Pure water served as reference. Incubation of the cells was done at 4°C without agitation; the time was variable between 20 min and 50 h as indicated. 100 μL cell suspension was used to measure activity and stability. The authors thank Thorsten Bachler for excellent technical support, and Claudia Ruth for providing Pichia expression vectors. The FFG, the Province of Styria, SFG and Ingenza Ltd. are acknowledged for financial support. JN&BN acknowledge Slovak-Austrian travel project SK-AT-0024-08. The authors SA, JN, GB, BN and AG declare that they have no competing interests. RS is employed by Ingenza Ltd. who is interested in the commercialization of an industrial chemo-enzymatic process for amino acid deracemization. SA and GB constructed the various Tv DAO expression cassettes and carried out Pichia pastoris strain construction. They performed the screening work and did the bioreactor cultivations. The screening assay was provided by Ingenza. SA also supervised the RT-PCR experiments and interpreted data concerning protein expression. JN performed cell permeabilization experiments and determined the activities and stabilities of whole-cell catalysts. AA and RS provided feedback about the reproducibility of the lab results in scale up experiments at Ingenza. IF, RS, BN and AG made substantial contributions to the conception, design and discussion of the overall project strategy and the experiments. SA, AG and BN wrote the paper. All authors have read and approved the final version of the manuscript.